Roger Brock, expert on ancient wine, talks about what did (and did not) go on at Greek drinking parties (symposia). 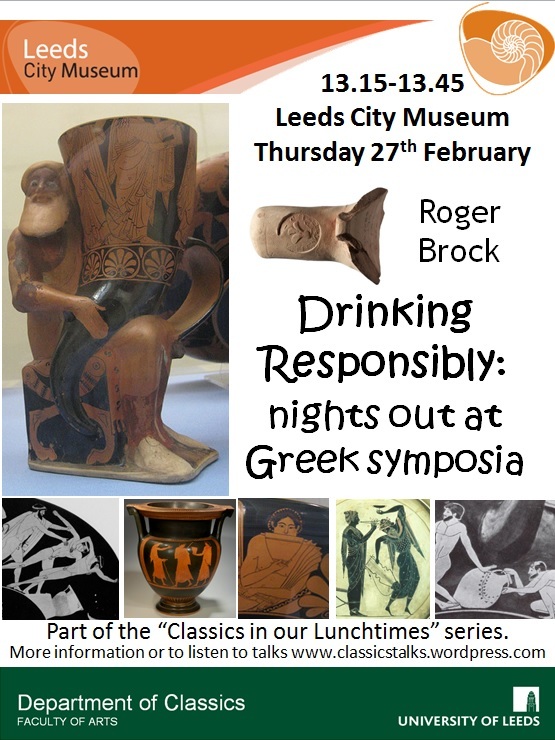 The talk will provide an introduction to ancient wine-drinking, including the vessels involved (some examples of which can be viewed in the Leeds City Museum’s Ancient Worlds Gallery) and the regulatory practices adopted to limit drunken and anti-social behaviour – ranging from the volume and alcohol content of the watered wine drunk to the religious dimension of drinking parties to the influence of peer pressure. This talk includes some of the material used for Light Night 2012, where Roger appeared in conversation with Dionysus/Bacchus, god of wine. The talk will take place in the Ancient Worlds Gallery (top floor of the Museum, accessible by lift from the entrance level) and will be artefact focused.